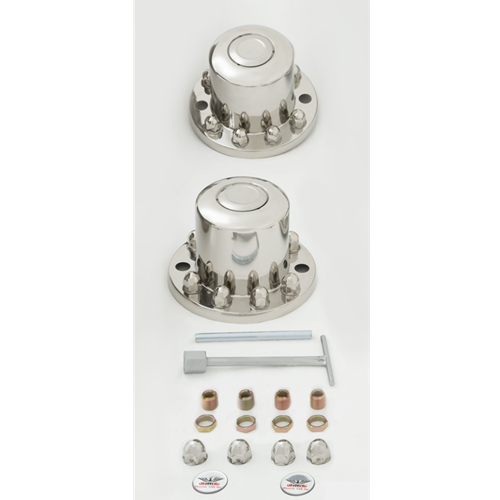 Rear polished stainless hub cover kit mounts to 10 lug on 285mm bolt circle, 22mm lug stud diameter, hub pilot applications. Covers hub and lugs. Took the hubcover and mounting hardware from Phoenix USA Inc. DOT Liner (NH252 and NH552) kits to make a nice hub and lug nut cover option. Attaches to lug stud over OE lug nut. Pop out centers allow hub access. Includes 2 hub covers and mounting hardware.